If you’ve only got time to visit one destination in Malaysia, it’s gotta be Penang. Although the bustling Malaysia capital of Kuala Lumpur is the perfect place for a quick stopover, Penang’s where you’ll really start to love this often overshadowed Southeast Asian country. In general, the weather in Malaysia is a bit of a mixed bag. And like much of the country, you’ll need to choose your dates wisely to ensure that the bulk of your Penang trip isn’t spent huddled up indoors to escape raging monsoon rains. Although you could conceivably visit Penang year round, overall, the best time to go to Penang is between December and March. During these months, the weather in Penang is at its most pleasant. You’ll fewer rainy days on average than other times of the year and plenty of blue, sunny skies to enjoy your trip to the fullest. Unless you’re in the midst of a longer Malaysia itinerary, the best way of getting to Penang is by plane. My favourite option is AirAsia, offering daily flights from KL that can rival the cost of the long drawn-out bus ride from the capital when booked ahead of time. There’s no better way to launch your first 24 hours in Penang than exploring George Town, Malaysia’s second biggest city, and—at least in my opinion—the country’s most interesting oversized urban experience. As much as I love spending time in Kuala Lumpur, George Town wears its history on its sleeve far more compellingly than the ever-changing capital. Wander past George Town’s ornate temples, unique street art, and hawker stalls, and you’ll quickly see exactly why you need to visit Penang! If you’re crunched for time in Penang (and even if you’re not), focus your attention on the sights & sounds of George Town’s UNESCO-listed Old Town. There’s plenty to see & do in Old Town, including some of the Penang’s top attractions and—most importantly!—some of the best food in Penang. Beyond being the centre of Penang’s backpacker universe, Love Lane is, well, a lovely stretch of colonial area shophouses, and the perfect place to launch your itinerary. Start your day strolling along its entire length to transport yourself into the George Town of old. If you need a cup o’ java to start the engine, fuel up at one of the many hip cafés along here. Don’t miss out on a chance to sip Malaysia’s famous white coffee featuring beans lightly roasted in palm oil and served with condensed milk either hot or cold. Wheeler’s Coffee is a great choice here. Although the real action here begins to buzz after 6pm, the Chulia Street Hawker Stalls at the corner of Chulia and Carnarvon are the perfect place to grab a quick snack before exploring Old Town further. It might not seem like much of a breakfast snack, but I’d highly recommend a mouth-watering bowl of wonton noodles. Topped with succulent BBQ pork, this Chinese dish, one of the most popular in Penang, will have you quickly drooling for more! Venturing deeper into Old Town, you’ll be ever more enchanted by Penang’s diversity, especially when you stumble upon Kapitan Keling Mosque. Built in 1801 by Indian Muslim, this Indo-Moorish-style mosque is absolutely striking. 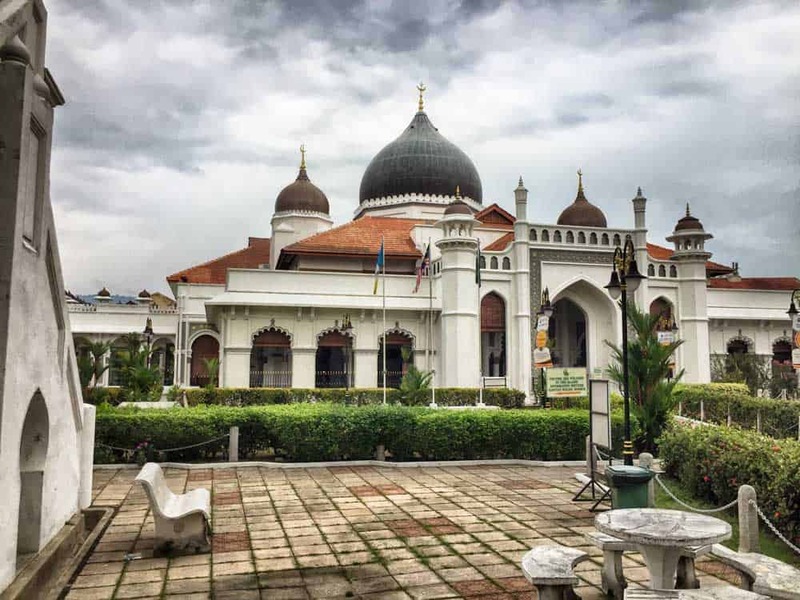 With its pristine whitewashed façade, punctuated by ornate archways and Mughal-style domes, the Kapitan Keling Mosque is a must-see on any Penang travel itinerary. Further north on Pitt Street (Jalan Masjid Kapitan Keling), history & culture buffs should also set their sights on St. George’s Church, the oldest Anglican church in Southeast Asia; and the Goddess of Mercy Temple, a Taoist temple dating back to 1728. 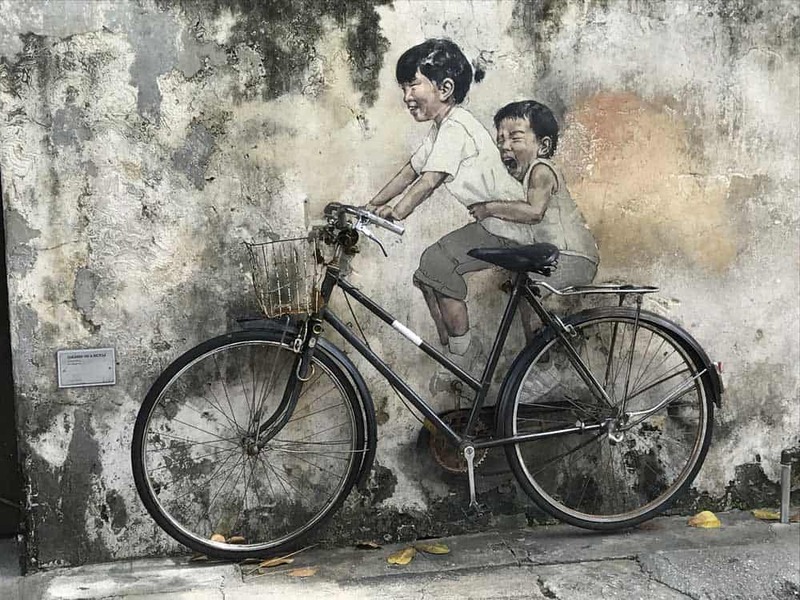 Visitors rave about Penang’s street art. And one of the most famous places in George Town to see it in action is on Lebuh Armenia in Old Town. Even without its famous street art, Lebuh Armenia is one of the city’s loveliest and liveliest corners. The street is graced with everything from Buddhist temples and food stalls to souvenir shops sprouting up in age-old Chinese merchant houses. Wander around for a bit here, slipping into the side streets to escape the tourist crowds and revel in Old Town’s charming atmosphere. Want to make the most out of your visit to George Town? Take on one of these hand-picked tours! George Town Heritage on a Plate: Combine a walk through some of Old Town’s coolest areas along with a taste extravaganza on this 3-hour food tour. 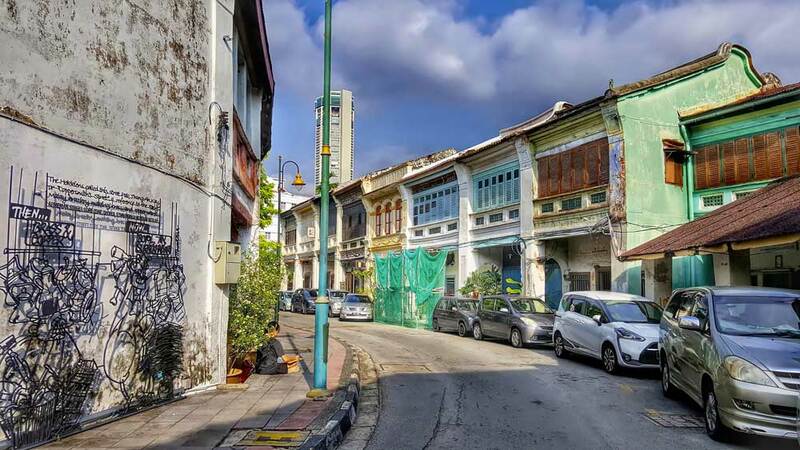 George Town History Tour: Discover Penang’s history on this private half-day tour through George Town including stops at the Clan Jetties, Pinang Peranakan Mansion, and the Reclining Buddha Temple. Penang Heritage Tour: Fit more into your day with this full-day private tour of the UNESCO Old Town including stops at the Penang State Museum, Street of Harmony, Khoo Kongsi Clan House, Pinang Peranakan Mansion, Made in Penang Interactive Museum, and more. Includes round-trip hotel transportation. 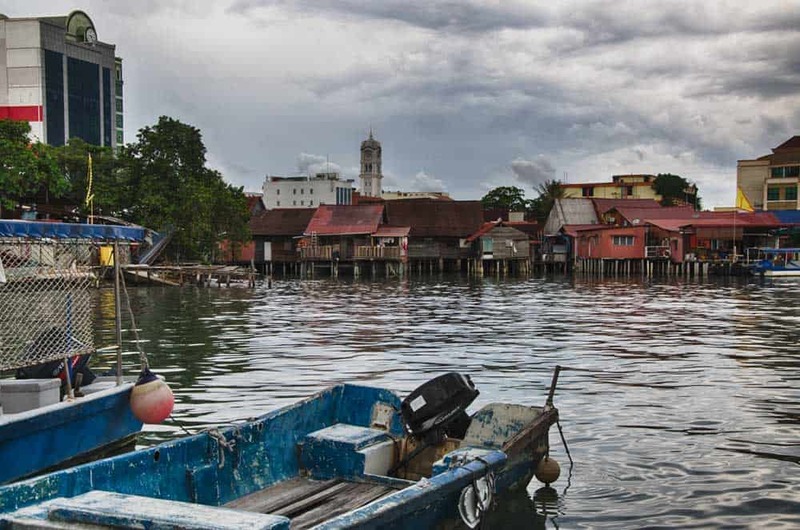 Follow Lebuh Armenia east to stumble into one of George Town’s most compelling attractions, The Clan Jetties of Penang. Featuring houses built atop the water on stilts with lovely strait views as their background, these waterfront settlements, dating back to the late-19th century, are a pleasant surprise in a country that’s modernizing at a breakneck speed. 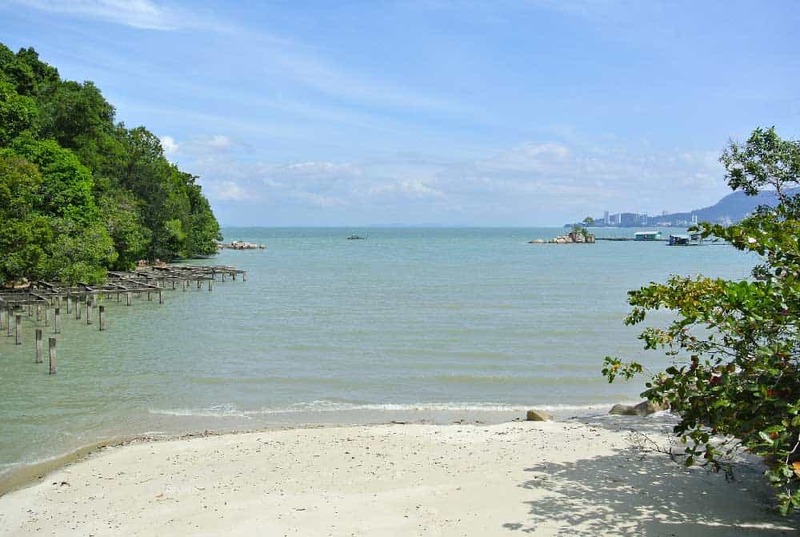 Even if they seem like a Disneyland-esque tourist attraction, keep in mind that The Clan Jetties of Penang are a living neighbourhood. As you’re wandering through, be sure to remain respectful of the area’s residents by keeping your noise levels to a minimum and obeying the “no photography” signs where visible. Want some company for your George Town sightseeing? 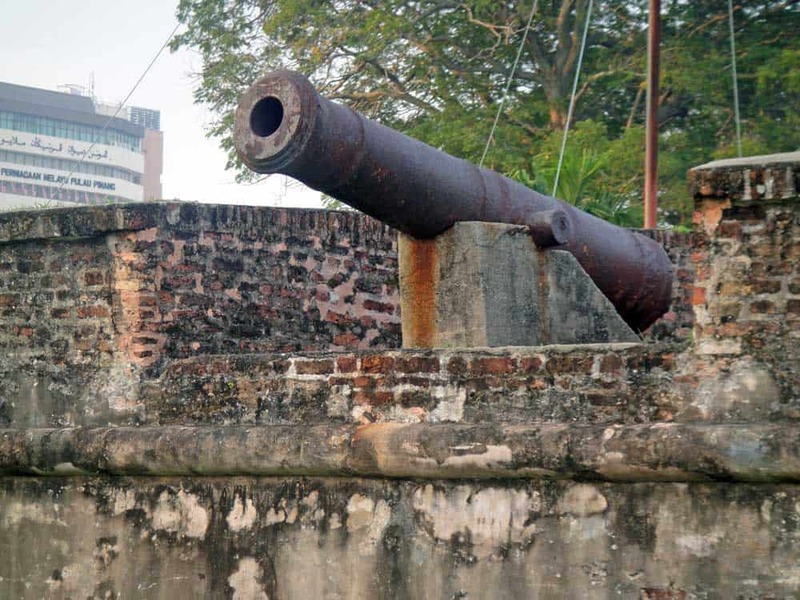 Check out these historical tours of Penang! George Town Highlights Tour: Spend the day soaking in many of George Town’s top sites on this action-packed private tour. Stops include Clan Jetties, Street of Harmony, Fort Cornwallis and lunch at a hawker centre. Penang Trishaw Tour: Give your legs a rest and explore Penang on a traditional trishaw on this value-laden 3-hour tour. Highlights include Fort Cornwallis, Yap Kongsi Temple, Kapitan Keling Mosque, and Little India. From The Clan Jetties, it’s about a 20-minute walk along Pengkalan Weld to Fort Cornwallis. One of the most popular places to visit in Penang, Fort Cornwallis is the largest remaining British fort in all of Malaysia. Truthfully, if you’re tight for time on your Penang itinerary, anyone without more than a passing interest in Malaysian colonial history wouldn’t be missing out on much to pass on paying the entrance fee (RM 20) to see Fort Cornwallis up close. Far better is to soak in the coastal views here and pop into the nearby Padang Kota Lama Food Court or Esplanade Park Food Court, two popular hawker centres that are perfect for lunch or a midday snack with sea views. Need a little more insight into George Town? Hop onto one of these top-rated tours! George Town Highlights Tour: Hit up Penang’s top places to visit on this full-day private tour through the city centre. Includes stops at Fort Cornwallis, the Clan Jetties, Street of Harmony, and a nasi kandar lunch at a hawker centre. Penang Trishaw Tour: Explore Penang on the back of a trishaw! Relax as this 3-hour tour wheels you through top sights like Fort Cornwallis, Yap Kongsi Temple, Kapitan Keling Mosque, and Little India. From Fort Cornwallis, walk west along Lebuh Light for about 15 minutes to catch a glimpse at one of the most classic examples of Penang architecture, the Cheong Fatt Tze Mansion. This former Chinese merchant house is one of the most staggering buildings in George Town. 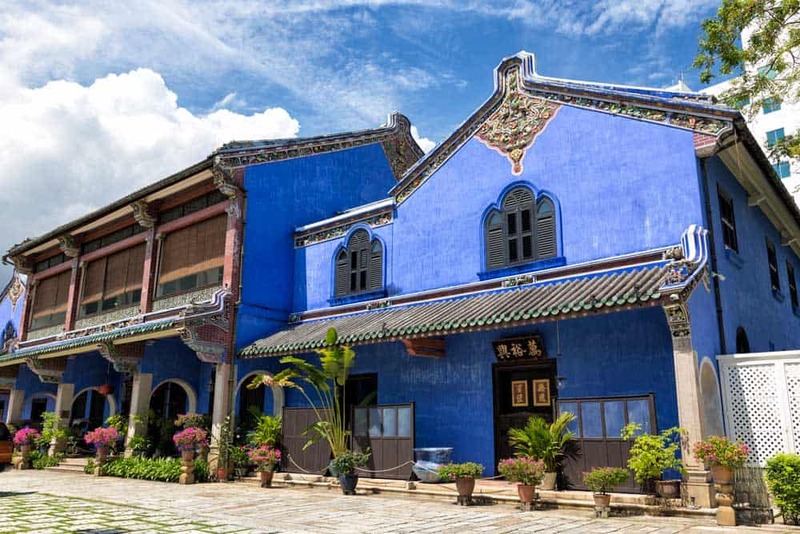 Painted bright blue and sporting a traditional Hakka–Teochew-style façade, the Cheong Fatt Tze Mansion will catch your eye from the moment you see it. To get a glimpse of the mansion’s lovely inner courtyard, you’ll have to time your visit: Official tours of the Cheong Fatt Tze Mansion only depart a couple times a day. Even better is to book a stay at the Cheong Fatt Tze Mansion. The mansion is no longer simply a tourist attraction, but houses one of the best boutique hotels in Penang—it’s well worth the small price to experience an important piece of Penang history firsthand! After spending some time exploring George Town’s centre freely, feed your growing appetite and tackle some of Penang’s most famous foods elsewhere in Old Town. Lebuh Kimberley: A popular food street in the heart of Chinatown that starts to burst at the seams with hawker stalls come nightfall. This is one of the best places in town to chow down on char kway teow, a famous dish consisting of noodle draped in a dark soy sauce and topped with seafood. Lebuh Keng Kwee: A short alleyway one block south of Lebuh Kimberley that’s famous for its assam laksa (hot & sour tamarind-based seafood soup) and chendul (shaved ice with green rice jelly). Lebuh Queen: A street in the heart of George Town’s Little India that serves the city’s best Indian delights. Dig into some nasi kandar (fragrant curried rice and meat) here. New Lane: A fantastic food street just west of Komtar off Jalan Macalister. Many of the dishes here are Chinese in origin. Try out an oyster omelette or some savoury chee cheong fun (rice noodle rolls). Ready to fall in love with Penang’s food? Gobble up the island’s delights on one of these food tours! Heritage Food and Fun Tour: Join in on this 3-hour small-group tour to taste the best of Penang! Includes the tasting of 10 different local dishes at various markets and cafes. Taste of Penang Food Tour: Experience the brilliant flavours of Malaysia’s top food destination on this 3-hour culinary walking tour where you’ll indulge in tasty favourites like nasi lemak, assam laksa, char kuey teow, and murtabak. 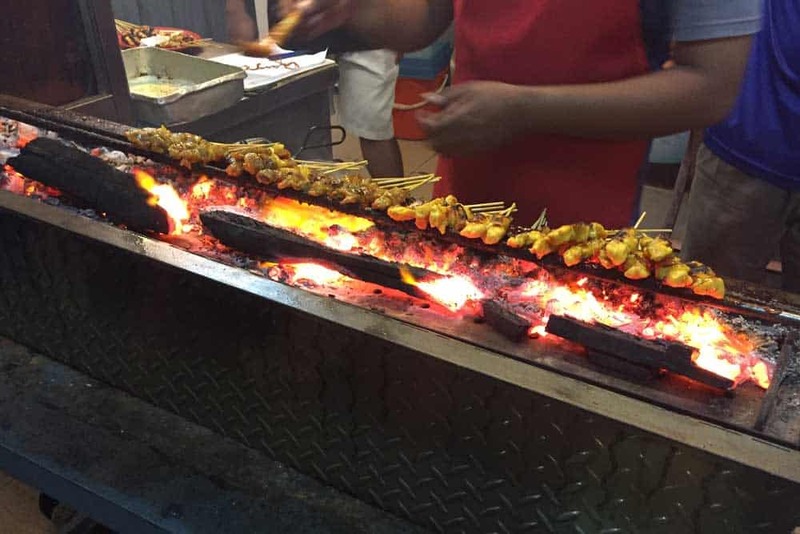 George Town Food Tour: Spend half a day exploring George Town with your tastebuds on this 4-hour early-evening tasting tour! After a day of bustle in George Town, you’ll cherish getting to spend a little time exploring the quieter western side of Pulau Penang. This is precisely one of the most compelling parts of travelling to Penang: There’s a little of everything for every type of traveller. 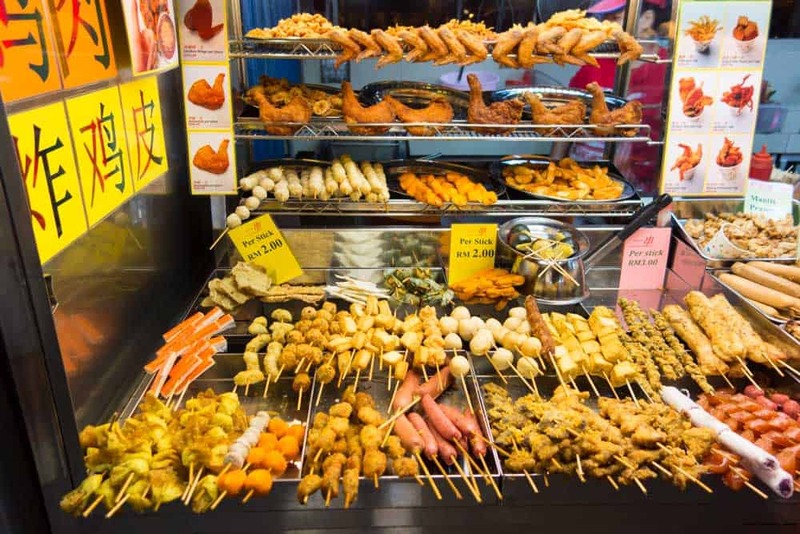 Grab a quick bite in George Town and stock up on some supplies, including snacks and plenty of water, before hopping aboard Bus 101 for the hour-long ride to Penang National Park (Taman Negara Pulau Pinang). This lovely slice of nature—actually one of world’s smallest national parks!—is the perfect escape from George Town’s big city buzz. 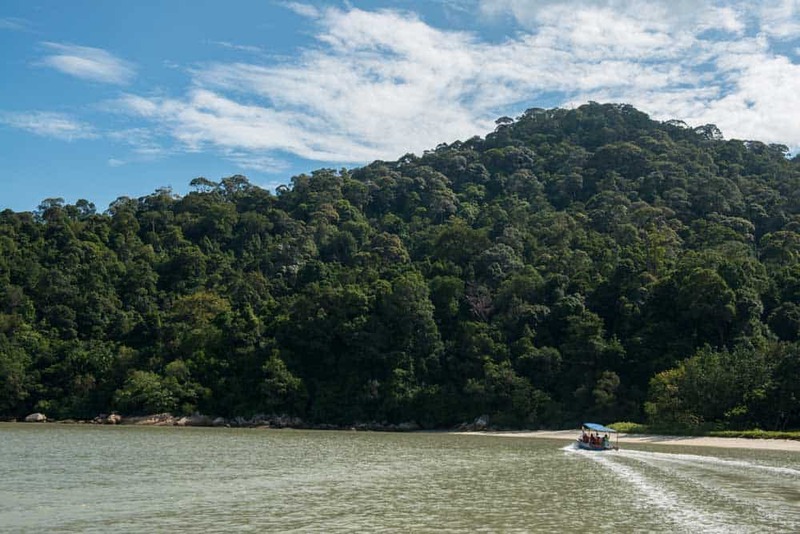 From hiking through its tropical interior to uncovering some of the best beaches in Penang, there’s plenty to do in Penang National Park. 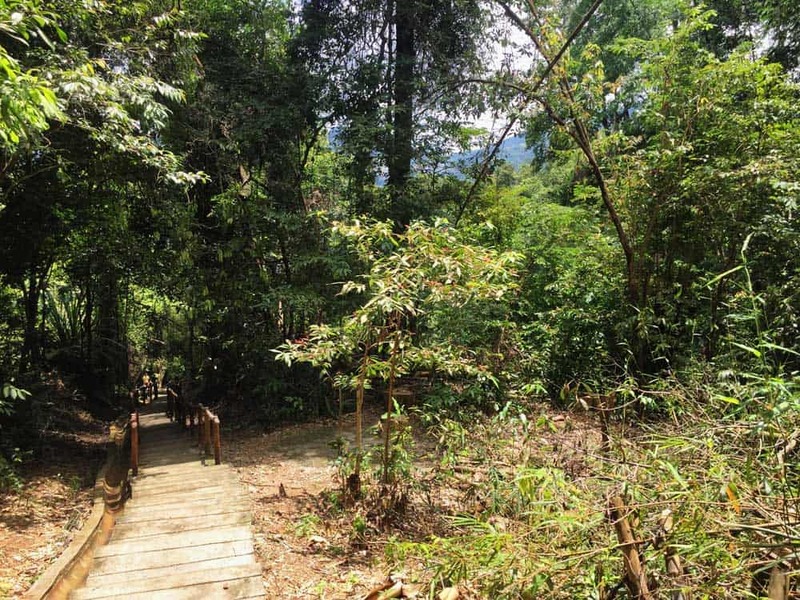 By far, the best way to experience Penang National Park is on a hike. From the park entrance where Bus 101 drops you off, there are two main trails: one to Monkey Beach, the other to the Turtle Sanctuary and the off-the-beaten-path beach of Teluk Kampi. With only three days in Penang, you’ll need to make a judgement call; you won’t have the time nor the energy to do both trails in one day as they are each about a 1.5-hour hike each way. The trail to Monkey Beach is the slightly easier of the two hikes. It’s also the most popular. If you’re looking for serenity and peace, this might not be quite the idyllic escape you’re picturing. The Turtle Sanctuary trail is steeper, more difficult, and, naturally, quieter. If you’re looking for a more relaxing seaside experience on a cleaner and less-crowded beach, this is the trail you should set your sights on. Whichever trail you choose, be sure to bring all all the essentials including as much water as possible. In the hot & humid weather of Penang you’ll need to hydrate frequently to avoid heat exhaustion or sunstroke. To plough through the steep jungle trails, you’ll also need to wear excellent footwear. I’d recommend a good pair of hiking shoes (check out these top choices for men & women) with good support & excellent traction. No flip-flops unless a sprained ankle (or worse) is in your trip plans! If hiking isn’t your cup of kopi luwak, opt instead for a boat ride to Monkey Beach or the Turtle Sanctuary. It’s a huge time saver, but comes at the expense of missing out on Penang National Park’s spectacular scenery. Instead, why not get the best of both worlds? Combine a hike to Monkey Beach with a boat ride to the Turtle Sanctuary, returning to the park entrance either via the alternative hiking trail or by boat (you’ll need to ask your captain to wait for you). Want some company while exploring Penang National Park? Hop onto one of these top-rated tours! 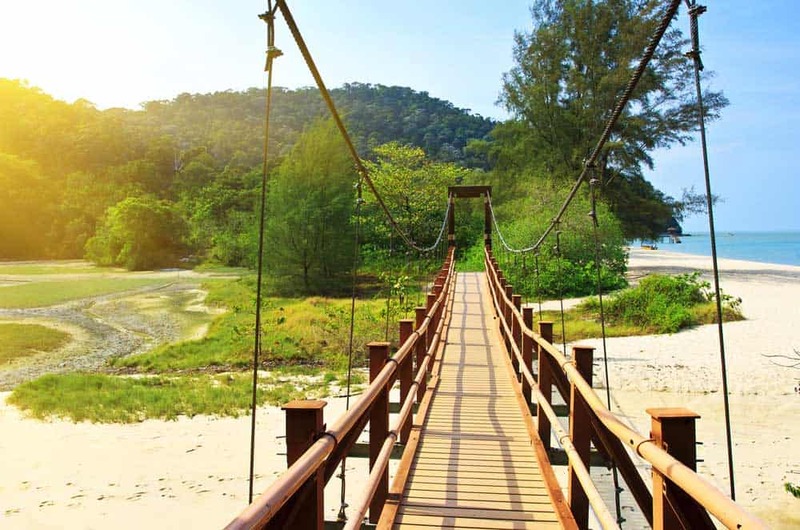 Penang National Park Half-Day Trek: Hike through rainforest trails to some of Penang’s most pristine beaches among wildlife on this exciting half-day active tour. Includes round-trip hotel transportation and a 20-minute boat tour. Half-Day Monkey Beach Break: Find your peace on the white sands of Monkey Beach (Teluk Duyung on this half-day excursion where you’ll get to see diverse wildlife from the beach’s namesake monkey to flying lemurs to sea turtles. You simply can’t visit Asia without spending time in a night market. And on Pulau Pinang, Batu Ferringhi Night Market reigns supreme. 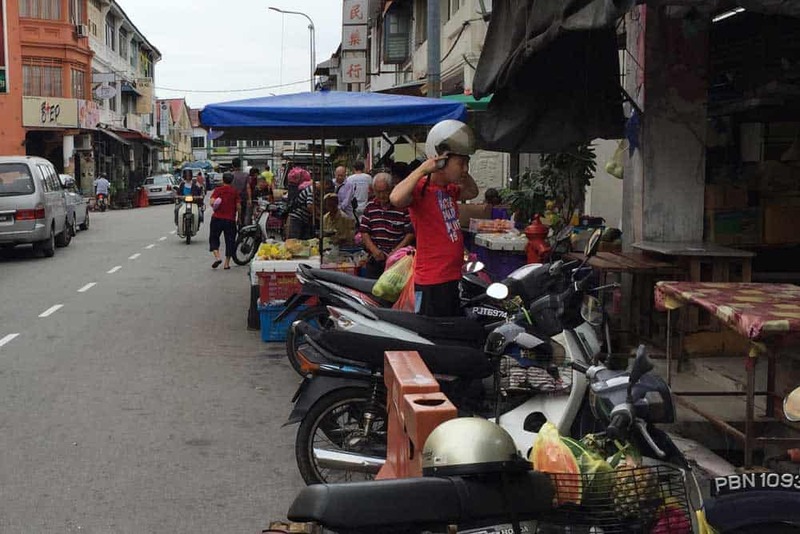 Located in the small seaside town of Batu Ferringhi, just 15 kilometres from George Town’s centre, this bustling night market has a little of everything to keep your attention. The buzz of Batu Ferringhi Night Market begins after about 7pm as shop vendors roll in their carts along the town’s main road to peddle everything from knock-off Adidas shoes & sandals to boarder shorts & backpacks. And, of course, who could forget the food? Batu Ferringhi Night Market could well be one of the best places to eat in Penang. Besides choosing one of the random restaurants along the strip, pop into the Long Beach Kopitiam for a wide selection of reasonably-priced & delicious local Penang favourites including satay, char kway teow, chicken biryani, assam laksa, and mee rebus. Want to squeeze the most out of your visit to Batu Ferringhi? Check out one of these awesome tours! Penang Nature Tour: Visit Batu Ferringhi along with other top sites like Penang Hill, Penang Botanical Garden, and Kek Lok Si Temple on this full-day tour. Half-Day Discovery Tour: Spend the afternoon touring much of Penang on this 5-hour private tour including stops at the Tropical Spice Garden, Teluk Bahang, and the Batu Ferringhi Night Market. 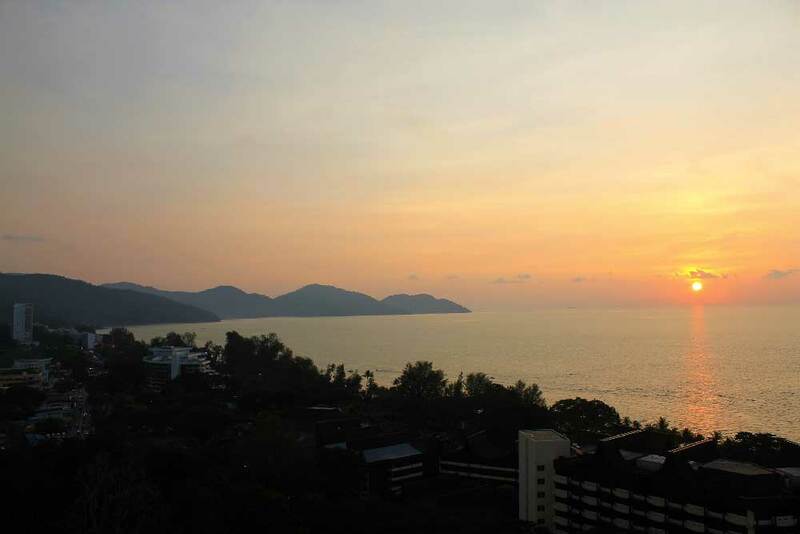 Batu Ferringhi Hidden Gems: Move away from the resort town’s hotel strip with this 3- to 4-hour tour through some of the area’s lesser-known attractions. With your three days in Penang coming to a close, we’ve saved some of the island’s best attractions for last. After waking up in George Town, hop onto Bus 203 in the centre towards Air Itam to get your day off to an exciting start. Since it’s outside George Town proper, many first-time visitors to Penang miss out on the glorious Kek Lok Si Temple. Peering onto Penang Island from its hilltop perch at Air Itam, this humongous Buddhist temple complex is the largest in Malaysia and one of the most important in all of Southeast Asia. At the centre of Kek Lok Si is the (literally) unmissable Ten Thousand Buddhas Pagoda. Standing seven storeys and 30 metres high, this pagoda mixes up three different Buddhist architecture styles: Its top crown, crafted in typical Burmese style; its mid-tiers, in distinctive Thai design; and its base, a typical Chinese octagon. Elsewhere on the grounds of Kek Lok Si, you can stroll leisurely alongside fish ponds, pavilions, and Buddhist statues. Don’t miss a chance to burn your quads on a walk up to the highest levels of the temple where a massive 36.5-metre-high bronze statue of Kuan Yin (the Goddess of Mercy) peers down upon the complex. Want to make the most out of your visit to Kek Lok Si? Check out these recommended Penang tours! Penang Hill & Kek Lok Si Afternoon Tour: Escape the bustle of central George Town on this half-day tour to Penang’s quieter side. Price includes admission to both Penang Hill and Kek Lok Si Temple. Private City Sightseeing Tour: Squeeze in some of the best that Penang has to offer on this full-day private tour. Highlights include Kek Lok Si Temple, Snake Temple, and Penang Hill. Nature Tour: Check out the island’s top natural sites on this full-day private tour including stops at Penang Hill (Flagstaff Hill), Batu Ferringhi Beach, and Kek Lok Si Temple. Round-trip hotel transportation and admission to the funicular railway and temple are included. Once you’ve had your fill of Kek Lok Si, hop back on the bus for a short three-kilometre ride to Penang Hill. As the first hill station built by the British, there’s plenty of history to back up this small slice of paradise in the middle of Penang Island. Penang Hill is a popular destination not just for its views (which are indeed spectacular), but for its coolest climate. At the summit, you’re welcomed by a steady breeze and a temperature up to five degrees cooler than in George Town. Now, here’s the fun part. My absolute impatience for waiting in lines, led me to the latter. Asking around on how to find the Heritage Trail will be of little help as its not a popular option for getting up Penang Hill compared to the easy historical funicular. To find the trail, walk down the hill from the Penang Hill Lower Staton Terminus and take the first street to your left. As you walk up the hill, stay left, walking past Then Kong Thnuah Temple until the road turned into a narrower paved trail. Soon, you should see the Penang Hill Railway up ahead. Walk towards it and you should see the trailhead. Take the stairs directly left of the trailhead sign. Just a word of warning: The Penang Hill Heritage Trail is NOT an easy hike. Although the trail conditions are fine, it’s all uphill. Be sure to take plenty of water. TIP: If you get completely gassed mid-way through (a distinct possibility in this heat! ), you can catch the funicular at the Middle Station to complete the rest of the journey. Once you’re atop Penang Hill, there are once two options for returning: 1) the funicular; 2) the Jeep Trail to the Penang Botanical Gardens. Once again, because I have no patience for waiting in massive line-ups, the Jeep Trail (let’s face it: it’s a road) it was. Although it’s only 5 kilometres down to Penang Botanical Gardens from the top of Penang Hill, the Jeep Trail can be a tad challenging. The road is quite steep in parts and after a couple kilometres, there’s no doubt you’ll start feeling a little shakiness in your quads and calves. Getting ready for the natural beauty of Penang Hill? Hop onto one of these hand-picked tours! 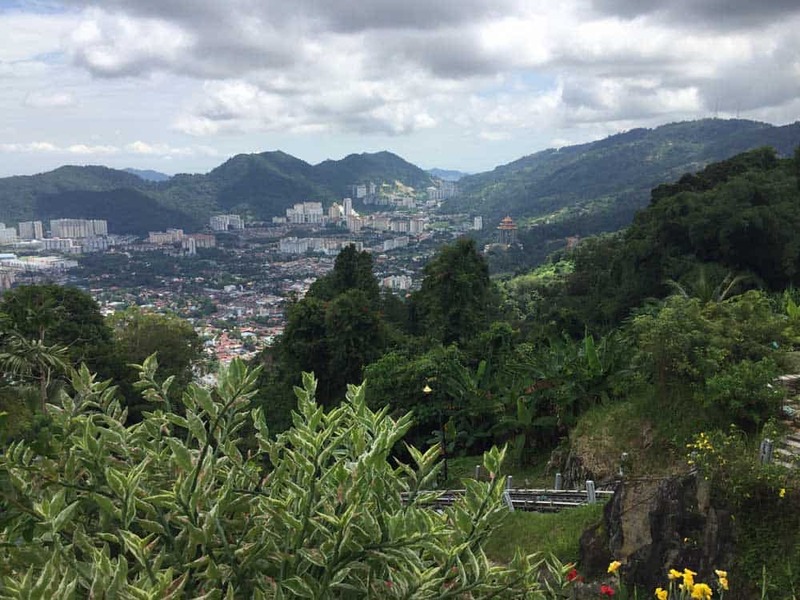 Nature Walk at Penang Hill: Experience the lesser-visited corners of Penang Hill on this 4-hour tour through the Nature Trail and The Habitat Canopy Walk. 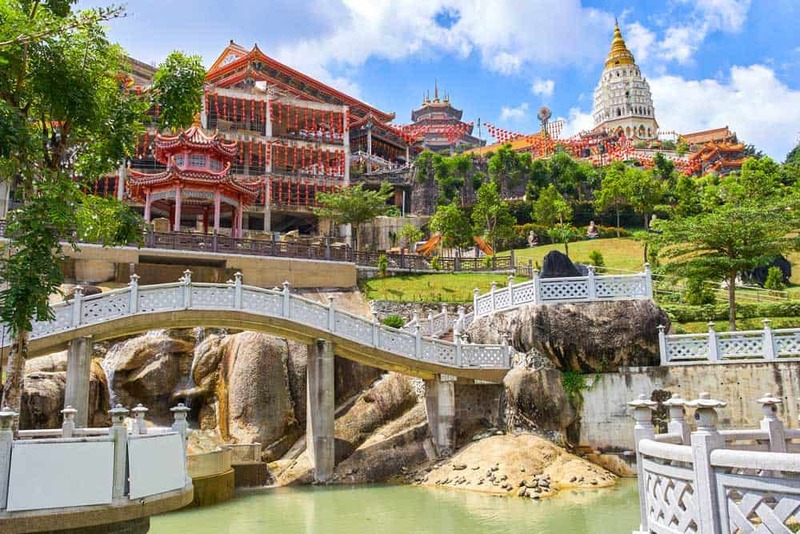 City & Temple Tour: Dazzle over some of the key sites of Penang including Kek Lok Si Temple, Wat Chaiyamangkalaram (Reclining Buddha Temple) and Dhammikarama Burmese Temple. Also includes fast lane access to the Penang Hill funicular railway. Private Heritage Nature Walk: Learn about the British hill station heritage on this nature walk. Includes visits to the Penang Monkey Cup Sanctuary Rainforest, Tree Top Walk, and Canopy Walk. If savouring some more Penang’s best food is on your agenda, I’d recommend heading over to the Gurney Drive Hawker Centre. This food court is among the top hawker centres in Penang, and is an absolute must for foodies. You’ll find all your Penang food favourites here—from char kway teow & chee cheong fun to laksa & satay. Can’t stop thinking about Penang’s yummy food? Indulge your cravings on one of these hand-picked food tours! A Taste of Penang Food Tour: Let the incredible flavours of Penang overtake your tastebuds on this private 3.5-hour tour through Gurney Drive and the Chocolate and Coffee Museum. 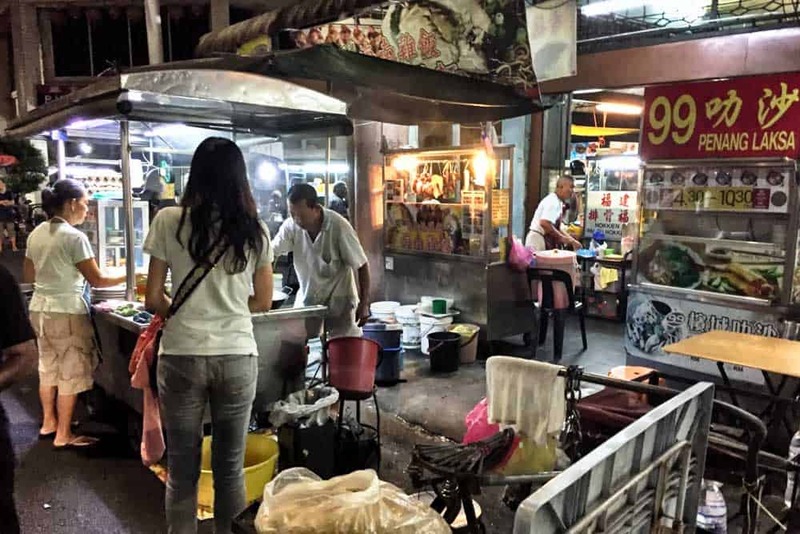 George Town Food Experience and Trishaw Ride: Eat your way through the street food capital of Malaysia on this 3-hour tour to the Gurney Drive hawker centre. Sample dishes include laksa, char kway teow, and satay. Tour includes a relaxing after-dinner trishaw ride. Cultural and Food Experience Tour: Combine a full-day of sightseeing with tasting local dishes like char kway teow, laksa & chendol on this excellent day tour. Includes hotel pick-up and drop-off. Le Dream Boutique Hotel: A clean & modern boutique hotel in the centre of George Town. Plenty of extras like a rooftop spa tub and rooftop bar help this property perform well above its pay grade. Cheong Fatt Tze Blue Mansion: A historical property converted into a boutique hotel, this lovely 4-star is undoubtedly one of the most unique places you could stay anywhere in Asia! Eastern & Oriental Hotel: The absolute top 5-star in Penang, this 19th-century heritage hotel delivers the ultimate Penang luxury experience. From its glorious sea views to its six on-site dining options, this hotel’s not one to miss.